A local community is moving forward after the 2015 floods with help from their Community Theatre. Kendal Community Theatre has brought local people together by inviting them to write plays for their collection, Kendal Yarns Festival of New Plays. With £2,000 from the Cumbria Flood Recovery Fund, the theatre group had a suitable space to rehearse and perform the series of plays about Kendal. 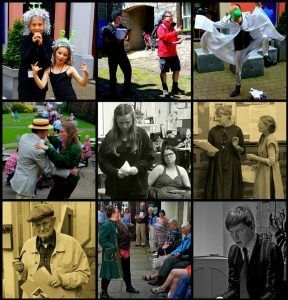 Kendal Yarns Festival, portrays the South Lakeland market town in a series of 58 new 15-minute plays penned by writers of all ages from the community. All the plays make reference to Kendal in the past, present and future. As the scripts developed, the budding playwrights could attend a series of workshops to help them with their writing. Actors, directors, stage managers and technicians brought to life the stories written especially for the festival over a week at the end of July 2016, and gave the audience a wonderful experience. By working together for the festival, people were encouraged to share their own experiences of the flooding, which in turn helped them come to terms with what happened. A group of sheltered housing residents at Edgecombe Court, which was flooded during Storm Desmond, even put together a play with the help of playwright Louie Ingham to tell the story of what happened to them. One of the writers said: “The last time I wrote a play was at school 30 years ago when I submitted a script for my CSE English. Yarns was a bit like a nudge in the ribs…it reminded me of those early days and with encouragement from friends who were also thinking of submitting plays, I was persuaded to have another go.